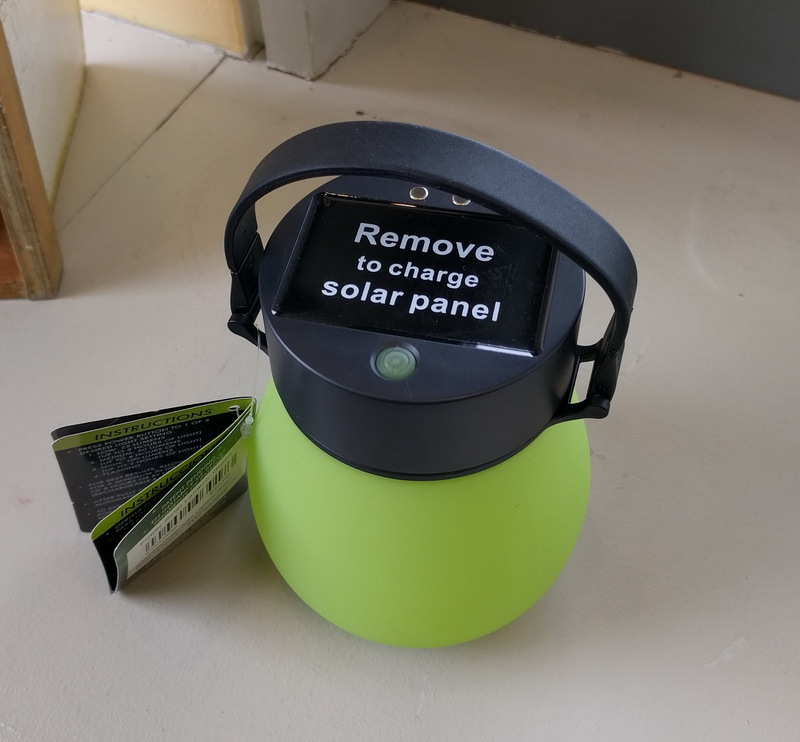 This is a lightweight solar lamp that is collapsible. When refugees and migrants escape adverse circumstances in search of better lives, the organizations that assist them tend to not prioritize sustainable energy development as a tactic. But if these relief providers follow the recommendations of two reports published by the EU Energy Initiative Partnership Dialogue Facility (EUEI PDF) and Moving Energy Initiative (MEI), they will start doing so. How can sustainable energy help stabilize nations so that potential refugees and migrants can stay where they live? As these two research reports show, energy scarcity drives displacement. And renewable energy technologies can alleviate this problem. What can sustainable energy do to improve the standard of living of current refugees and migrants? This includes people living in camps, people on the road, and/or people in other countries. It can greatly reduce their cost of living, improve the climate change consequences of their electricity use, give them access to better cooking and lighting technologies, and also reduce violence they experience when harvesting wood. When donors participate in energy projects for displaced populations, they should use strategies that support local markets, build supply chains, and de-risk private investments, according to the November 2015 MEI report, “Heat, Light and Power for Refugees: Saving Lives, Reducing Costs.” Transferring cash to households may work better than giving them fuel. The scope of this international crisis is immense. According to the September 2017 report by EUEI PDF, “The Role of Sustainable Energy Access in the Migration Debate,” there are around 244 million people living outside their country of origin worldwide. Meanwhile, 740 million people have migrated without emigrating. Currently, there are 22.5 million refugees in the world; this number is the highest it has been since World War II. Figure 1. A diagram from the EUEI PDF report showing what economic factors drive migration. Reprinted with permission. Displaced populations are not represented in international energy access initiatives, the MEI report said. However, they bear very high costs and face many energy issues. The primary fuels they rely on are charcoal and firewood. This leads to deforestation. It also is sometimes unsafe for girls and women to collect firewood outside refugee camps. MEI estimated based on World Health Organization data that use of primitive fuels causes 20,000 displaced people to die each year. It also causes heart and respiratory conditions that can be especially harsh for very old or young people. Candle use, kerosene lamps, and open fires can cause burns. Kerosene in plastic bottles can poison children who drink it accidentally. Poorly designed diesel systems often are used as stopgap measures to power facilities at refugee camps. Their energy efficiency could be greatly improved, the MEI report said. One high-impact solution would involve broadly introducing better cookstoves and solar lanterns. MEI estimated this could save $323 million a year in fuel expenses. The capital investment to provide the equipment would be $335 million. This investment would save 6.85 million tons of carbon dioxide per year. EUEI PDF is bringing stakeholders together to start solving this problem in an interdisciplinary way. The momentum for this change appears to be coming from within Europe and its partners. “I think the migration and refugee situation in Europe has prompted Europe, its neighbors, and its partners to have a look again at what it is doing in development cooperation [to reach] sustainable solutions for the longer term. It has raised a number of questions about its responses in the shorter term,” Wollensack said. Migration can occur due to many causes, the EUEI PDF report said. These can include poverty, violence, disasters or conflict. Environmental degradation, inadequate healthcare, and food insecurity also drive migration. Displaced communities often relocate to urban environments or the areas surrounding them. Migrants and refugees experience violence and crime. They also have health problems that can be difficult for them to address. Disease outbreaks can occur in refugee settlements near metro areas. Figure 2. 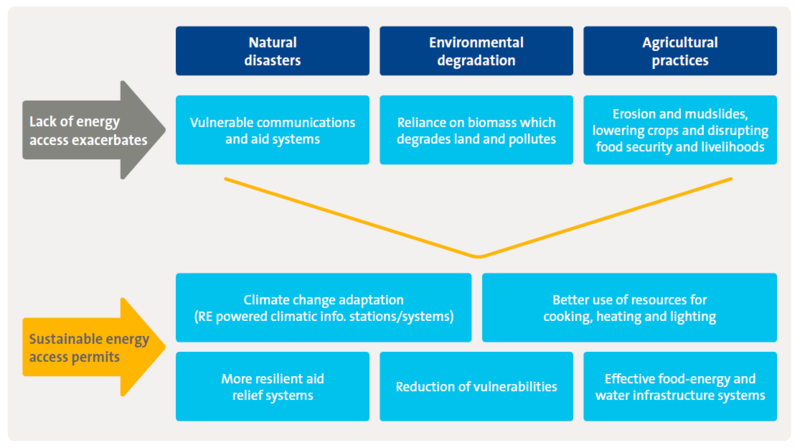 A diagram from the EUEI PDF report showing what environmental factors drive migration. Reprinted with permission. Improved energy access pre-migration can stabilize populations so that migration becomes less necessary, the EUEI PDF report said. For example, solar-hot-water pumps can help agricultural producers adapt to climate change. Solar PV power plants can improve local resilience to natural disasters. Off-grid renewable energy can improve the resilience of hospitals, schools and businesses. Wollensack said United Nations High Commissioner for Refugees and United Nations Institute for Training and Research are starting to work on clean energy solutions for refugees. Development organizations are starting to design and create programs in migration ‘hot spots’ such as Lebanon. These projects supply energy to local residents as well as migrant communities and can create local jobs. 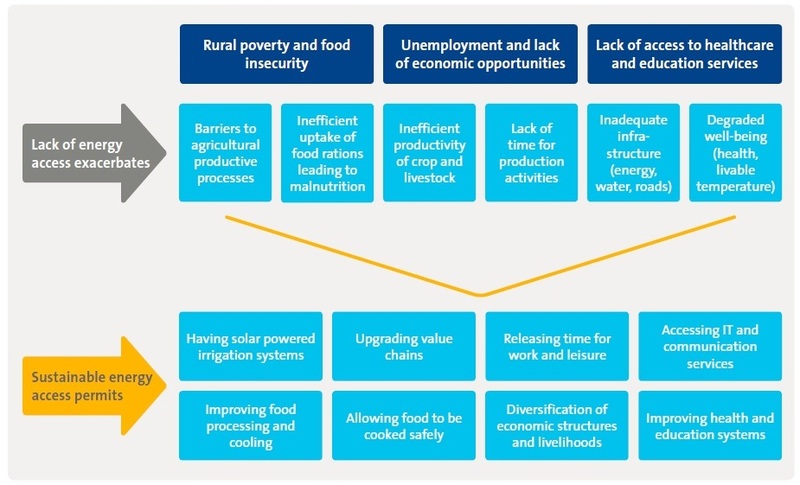 EUEI PDF recommends using a coordinated planning approach for energy access. Involving the private sector, development and aid organizations, local authorities, and nearby communities can mobilize resources to solve these problems. Local institutions like schools, hospitals and offices can become anchor clients for energy companies. Businesses can offer improved financing for long-term energy access. Providing access to computer-based education is especially important for migrants’ quality of life. Although local communities may be reluctant to build synergistic energy plans with migrant communities, the MEI report said these plans can create win-win solutions for them. Taking a mutual-assistance perspective can improve the relationships between these stakeholders. The private sector can help medium-to-long-term refugee populations move toward self-reliance. MEI recommends the formation of an international advisory panel to steer the implementation of its guidelines. The report encourages decision makers to create a global revolving fund to support agencies that want to invest in energy-service projects. Integrating sustainable energy into the planning of camps for refugees would result in improved outcomes. These designs should be pilot-tested. Involving the private sector in developing solutions is critical. As a step in this direction, the European Union’s External Investment Plan is working to reduce migration from Africa and other locations near Europe by promoting job creation and sustainable development. This plan is customized for countries’ individual needs and is based on a successful model that is already used in Europe. It supports investment in sustainable energy, agriculture, cities and technologies. It also encourages small-to-medium-sized businesses to expand. Financial institutions can play a role in investing in nations proactively to prevent migration, Wollensack said. This can include both creating jobs and building infrastructure. Hiring energy experts and planning lasting solutions can help humanitarian organizations reduce migration factors and assist displaced people. Moving beyond a short-term focus, these reports agree, can shift the ground rules and help stabilize communities. Wollensack said one example of a long-term solution would be buying and maintaining a mini-grid system for a humanitarian organization. As migrants and refugees seek to put down roots and find stable livelihoods, having environmentally sustainable cookstoves and lanterns can improve their quality of life, reduce their carbon footprint, and save them money.